One sunny day in August last year, three ambitious Musicians entered a former public bathhouse in east London. Six hours later they exited with the CD "Steamroom Variations". The CD that you hold in your hands represents the sum total of all that came before it. This Music pledges allegiance to the spirit of Ayler, the intensity of Brötzmann, the depth of Coltrane, the vision of Braxton, the courage of Stockhausen and the electricity of Fripp. This Music is built on the shoulders of these giants and many more. Built not only structurally but in its essence. This is the sound of catharsis. We had become bored with "virtual" ensembles and decided that only the truth would do. Magnus and i had been recording duo improvisations for a couple of years and it was becoming increasingly notable to us both that the popular trend of moving the making of music deeper into the computer was not good. We decided that we needed to be playing out live. I had heard of a very interesting London based drummer named Anthony Bianco and suggested to Magnus that we contact him about getting together. Within a few weeks we were jamming in a rehearsal studio with Tony in London. Decision Dream came into being on April 13th of 2004 at a concert in Västerås, Sweden at a venue called New Perspectives. It was the second time we had played together and the first time we had performed for an audience. What we tapped into from the first time that we played together was "the flow". Somehow, the three of us had arrived at a point in our collective perception where we were feeling the same kind of swing. Hearing the same cosmic chord. The Music of Decision Dream is wholly improvised. It is the ultimate expression of trust. None of us knows where the other is going, yet we trust that we will arrive at the same place at the same time. Tony Bianco refers to it as "...using time and timelessness...". The Music that results is magical, memorable, strong. Multi-faceted. Hip hop, Be Bop, Free Bop, Drone. The Music on "Steamroom Variations" was improvised direct to two tracks of a Pro Tools 4 TDM system running on a Mac 8600. There were no over-dubs.. Behringer pre amps were used on the microphones and the bass which was recorded direct via a Behringer Ultragain Mic 2200. The guitar signal was taken direct from a multi-effect unit and sent into Pro Tools. Both Magnus and i processed our instruments live using various delay/looping devices and multi-effects. Mastering was done at the Sunroom in Stockholm on a Yamaha AW2816 with a Behringer Ultradyne 2496 providing dynamics processing. Recorded “live” at London’s Steamroom studios in an afternoon session without any pre-written material, Steamroom Variations presents a vigorous document of improvisation at its most fervent. The album’s liner notes cite a bevy of influences, from artists like Albert Ayler, Anthony Braxton, Ornette Coleman, John Coltrane, Robert Fripp, and Karlheinz Stockhausen. Disregarding the intricate structural theories and harmonic concepts supporting the work of the aforementioned artists, but instead honing in on their experiments with improvisation, Decision Dream has channeled its inspirations into a furnace of white-hot expressionism. This electronic power trio navigates the possibilities of 21st Century free jazz by embracing the technology of its time and reveling in the potential. Electric guitarist Magnus Alexanderson, electric double bassist Jair-Rohm Parker Wells, and drummer Anthony Bianco recorded the album direct to a Mac running Pro Tools with all effects loops generated live and no overdubs added in editing. A generation ago one would have heard cries of blasphemy if someone so much as admitted to recording a jazz album using Pro Tools, let alone claiming to do so with no overdubs or edits. But in the end, the result is the same, whether digital or analog… this is live improvised music, what was played is exactly what the listener hears. What separates this outing from similar endeavors is the trio’s dedication to sustained energy. While dynamic, sonic diversity can be seen as compositional foresight, here the trio maintains an extremely high level of intensity for the duration of the record. This does not preclude structural variety however, as there are moments of focused exploration that do not rely on endless waves of sonic mayhem; there is always an edgy rhythmic variation, stuttered phrase or keening loop present to keep the listener’s attention. Where many like-minded efforts have a tendency to fall into a quiet, impressionistic haze, the trio maintains its edge by never allowing the music to be anything less than ecstatic. The album takes off for the stratosphere immediately with a three-part improvisation making up the bulk of the record, “Steamroom Variations 1-3”, and concludes with a short four and a half minute tune, “Life / less”, which condenses the longer form suite into a miniature variation, acting as a coda of sorts. The trio delivers a frenzy of activity for the majority of the program. Floating on a bed of shimmery loops, screaming feedback, and undulating bass, peppered with stinging fretboard acrobatics, all woven into a roiling undercurrent of frenzied trap set ruminations, the trio vacillates to and fro from apocalyptic abandon to post-Minimalist variations, without ever dropping the intensity level. 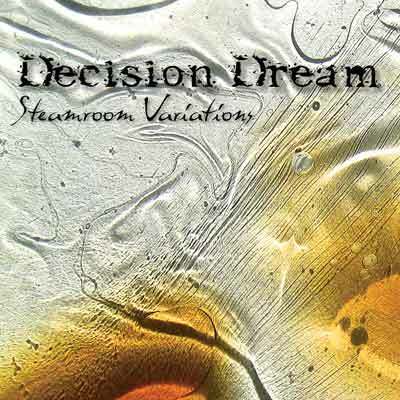 Decision Dream is an heir apparent to artists such as Sonic Youth, Nels Cline, Bill Laswell, Sonny Sharrock, and numerous other purveyors of free-wheeling electronic noise. The trio’s rapport is tight enough to suggest that these blokes have had plenty of experience playing together. They unleash a flurry of ideas over the course of an hour, sometimes so many that it can get a bit overwhelming, but never enough to obscure their efforts in a miasma of overblown distortion. Steamroom Variations is an impressive debut album, one likely to gain these newcomers some well deserved attention. "Steamroom variations" takes its name from the East London studio where Anthony Bianco (drums) Magnus Alexanderson (guitar) and Jair-Rohm Parker Wells (double bass) recorded this ode to sensual overload. In the wake of precursors like Last Exit, Decoding Society and the whole harmolodic wave generated by Ornette Coleman, these musicians release their strength with controlled fervour, alternating transformation and stasis, looking themselves in the eye within a unique visual that discards blind fury to channel a still raging power into interesting harmonic contingencies, unpronounceable rhythmic decompositions, confluences of electric prayers. After a nervous look for transitional passages, the music becomes a whole new experience in which the single instrumental voices emerge from a static yet boiling water, as their resonant extremities point to directions which - unknown as they are - reveal many exciting discoveries. It was a fine day in August 2004 when Anthony Bianco, Magnus Alexanderson, and Jair-Rohm Parker Wells went into a former public bathhouse in east London to make a recording, which they did in the space of six hours. They used no overdubs, though Wells and Alexanderson used delay/looping devices and multi-effects. Variations is the keyword here, and these players keep etching it into their music time and again. Is there a norm? Is there convention? Perhaps, but just for a time. There is no certainty as these flights of fancy take sound into different dimensions. The opening is not ominous of what lies in wake for the listener. The acceleration builds slowly, but the underlying sinew is unmistakable. Then it breaks open on feedback and loops, electronic impulses churning, the guitar screaming, the effects converging and then exploding. Before they are done, they have also dived into rock and heavy metal opening the styles with their open-ended inventions. And this is only Part 1. Part 2 departs from the first, lying in the folds of electronica and driven by drummer Bianco and the many facets that the guitar adopts, from an organ to a screaming banshee. When Part 3 comes, innovation continues to be the motivator. There is a wide collage of sounds that roll and tumble, heady inversions getting to room with spaces that breathe into the passages. But the core of this segment carries the true impact as spontaneous improvisation braids the strands into a pulsating, awesome tapestry. It tickles me to imagine that I’m hearing some futurist or alternate universe version of a Jimi Hendrix group when I listen to this manic outgrowth of the power trio. Well alright, maybe the freer moments of Hendrix at Woodstock meets a more reflective Fushitsusha. Anyway, it would have been easy for an electro-blowing session such as that on offer here to have deteriorated into shapeless noodling, but somehow, to group credit, I hear very little excess on this disc. In fact, repeated listening reveals Steamroom to be fairly frenetic but streamlined, transparent without loosing viscerality or power. Recorded in one afternoon in London late this past summer, the platter’s basically one mammoth three-part suite with a brief coda for good measure. From the outset, guitarist Magnus Alexanderson, bassist Jair-Rohm Parker Wells and trapist Anthony Bianco serve up a mixture of drone, scree and clatter that manages order through constantly on-the-toes communication, all of which begins fairly softly with vaguely “jazz” inflections in drum timbre. Within the first five minutes though, the line between jazz and noise is straddled, which happens more and more frequently as the disc unfolds in slow jagged arcs. At one point, things die down to near silence, an astonishing and well-executed effect, but it is short-lived. I don’t mean to give the impression that order is lacking here—it most certainly is not, but it usually comes in bizarrely interconnected loops, each one coming off like a microcosmic manifestation of the disc as a whole—organized asymmetry—and so the loops tangle and unwind themselves in perfect counterpoint to everything else roiling and bubbling in tandem. The drums are beautifully recorded, producing some fun spatial allusions if auditioned in “the sweet spot” and it’s often hard to tell bass from guitar, so effect-laden and inter-registral is almost every utterance. Do I even hear occasional delay on the drums—they’re remarkably dry otherwise. Maybe, and despite my inability to articulate in kind, the best thing about the disc is just how clearly presented everything is. No matter how many levels of feedback, distortion and whatever else is piled atop the remnants of what I’ll jump right on out and call instrumental purity, the trio identity is refreshingly ever-present. This is commendable, and I look forward to hearing wherever these folks take music that I have no qualms whatsoever about labeling fusion. Superb Swedish-based trio featuring Magnus Alexanderson on electric guitar & loops, Jair-Rohm Parker Wells on Fichter electric double bass & more loops and Anthony "Tony" Bianco on drums. This is a mixed trio, with each member from a different geographical place. I am unfamiliar with the guitarist here, but I do know Mr. Parker Wells quite well from his years playing with Machine Gun, legendary improv jazz/rock/noise quintet from New Brunswick, NJ that featured Bob Musso on guitar and the late Thomas Chapin on sax. Jair-Rohm has been living in Sweden for the better part of a decade. Drum wiz Tony Bianco is another American, who has been living in the UK for quite a while and has played with Paul Dunmall and Dave Liebman. 'Steamroom Variations' was recorded at Steamroom Studios in London and this trio had only played together a couple of times, although it is hard to tell from the way they play so well together. This trio excels at that free/fusion, high flying, spinning in waves and rumbling intense spirit. The first long piece sounds like the Scorch Trio with more electronic manipulation going. The rhythm team is powerful and massive in sound with the guitarist slowly adding his sonic seasoning to the storm. Magnus, the guitarist, plays layers of buzzing notes, often fractured by the use of a volume pedal. Considering that no one from this trio is very well known, they are certainly as great as any other free/jazz/rock power trio that anyone could mention. There is a strong balancing act going on here as Jair-Rohm's bass erupts ominously, sometimes bouncing on the strings, locking in the waves with Tony's monster drums as Magnus surfs on top, riding the waves as they crash on the shores of our minds. The loops and electronic effects are also well used, creating eerie sound to evoke the free spirits within. Fans of the Scorch Trio take note, this one's definitely for you!